If you are a coffee aficionado or just a regular drinker and would want to enjoy high-quality caffeine fix from anywhere, you need to invest in the best travel coffee maker. Travel coffee makers can also help save you cash as you will not need to buy your favorite brew as it can cost a small fortune to buy coffee in most coffee shops in the USA and many countries across Europe. These coffee makers are designed to be more lightweight and compact and are also easily packable and convenient to carry around. With a good travel coffee maker, you will have a reliable appliance for making coffee from almost anywhere whether you are camping, RV traveling or on an overseas trip. The small and compact coffee makers will also make an excellent gift for coffee lovers. And in this piece, we review 12 top-rated models and also explain the important factors to consider when choosing one. You can also read other product reviews such as travel coffee kit, French press, pour over coffee maker, stovetop espresso maker. 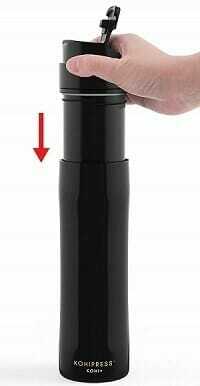 With the lightweight, compact and highly durable components that make up this AeroPress coffee maker, you can easily pack and carry it on all your travels. The top-rated travel coffee maker uses a rapid and total immersion brewing method that ensures you get full-flavored coffee without the bitterness that comes with over-steeping. This coffee maker also uses a microfilter to ensure that you will not get the annoying coffee grits in your coffee as you would with many French presses. 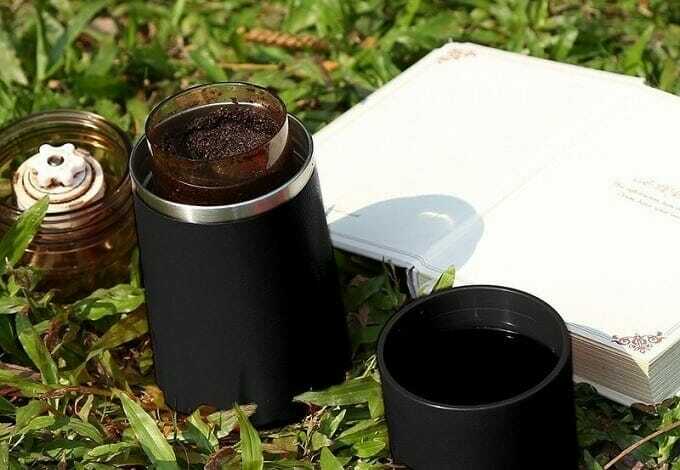 With the espresso-style coffee that you get from this AeroPress, you can also enjoy your lattes and other milk-based beverages even when traveling. And because it is super easy to take apart, cleanup should be super easy. While it is true that like any other AeroPress there is a steeper learning curve before you master the coffee making, and this is more so for the inverted method, there is more than enough instructions to make things easier for beginners. Once you master them, the pour-over coffee makers like this one from Coffee Gator will always give you some great tasting brews. The coffee maker is also one of the easiest to use on our list, and even beginners should have an easy time when making coffee on the go. It comes with a durable stainless steel mesh filter that is designed to offer many years of great service as it is tough enough and will never rust. And it has been laser-cut to help ensure all the coffee flavor is transferred to your coffee. Given that the mesh filter is very fine, you can be sure that no coffee grits will find their way into your cup. Both the mesh filter and glass carafe are easy to clean up given that a simple rinse is all they need, and you can also pack them quickly for your travels. 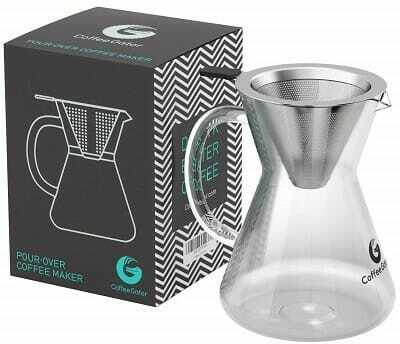 Although the glass carafe can be quite delicate, this should not stop you from carrying your pour over coffee maker when traveling as a little extra precaution and care is all you need. For the coffee lovers on the hunt for a single serve coffee maker for use when traveling, this Primula model will be a perfect choice. And to make it even better, it is the cheapest item among our travel coffee maker reviews. The coffee maker can brew in as little as 30 seconds depending on the strength and quantity of coffee that you want, and it is designed to be more lightweight and fully portable. To save coffee lovers cash, it uses a more economical fine mesh filter which besides being durable is designed to trap even the smallest coffee grinds. This coffee maker will fit most mugs and cups to ensure you can brew directly onto your favorite utensil, and it is a dishwasher-safe product that will be super easy to clean after use. Due to its size, this coffee maker will probably not be the best for making lots of coffee, but given that coffee will be ready in as little as 30 seconds, it can still be ideal for more than one person. 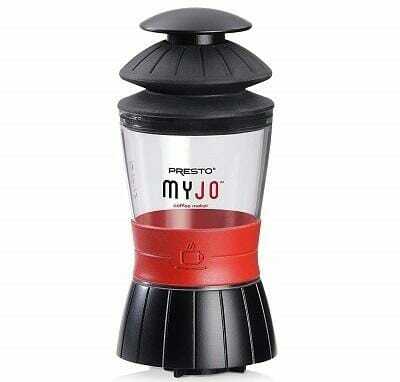 Presto’s MyJo is one of the best compact travel coffee makers that you can get anywhere. And this is not only because it is compact and fully portable, but also thanks to its ease of use and simple cleanup. This highly convenient coffee maker is also quite affordable and most of its convenience comes from the fact that it can use both pods and pre-ground coffee. Also, you can use this coffee maker to make other beverages like tea. Making coffee is a more straightforward process with this coffee maker as you only need to add coffee and hot water before pumping it over your mug. And given that it is also simple to take apart, cleanup should not take a lot of effort. Many coffee lovers will also love the fact that just like regular full-size espresso machines, this coffee maker allows them to choose from three cup sizes which are 6, 8 and 10 oz. If you are planning to travel with a group of coffee lovers, this French press coffee maker is a must-have because besides being portable it makes lots of coffee at a go. 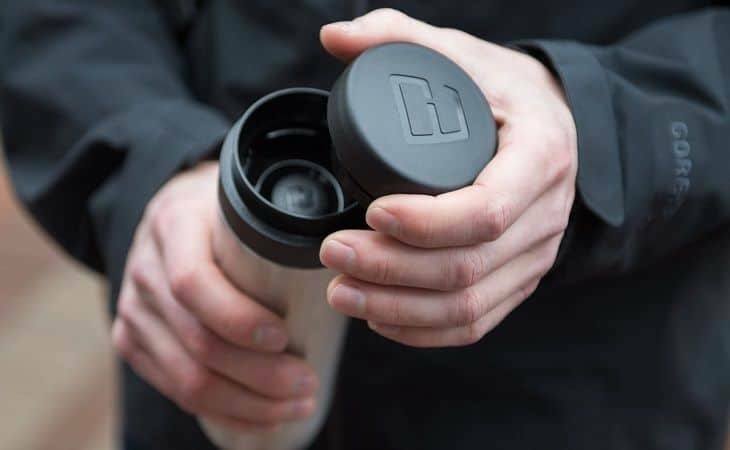 It can make 32 oz or about 8 cups of coffee at a go, and it has also been designed to withstand the abuse that comes with traveling as it comes with a durable and shatter-resistant carafe that is almost indestructible. Pressing is also made a lot easier by the comfortable handle and non-slip knob, and it also includes a nice plunger with a silicon gasket that will ensure you always get great tasting beverages. Besides the efficient primary filtration unit on the plunger, the coffee maker also includes a secondary filter on the spout to ensure your coffee will be free of sediments. And many users will also love that most of the components are dishwasher safe for easy cleaning. When compared to other travel coffee makers on our list, this French press is a little heavier and bulkier, but the good news is that it is still easily portable. Although you cannot carry your espresso machine when traveling, it is still possible to enjoy similar quality (or at least something close) espresso with a stovetop Moka pot like this one. What makes it one of the best portable coffee makers is the fact that it is made from a durable aluminum material that can withstand almost anything. The Moka pot is also designed with a safety valve for easier and safer use, and you can easily disassemble it which makes cleanup a breeze. The polished finish gives it an amazing look, and if you combine this with its classic octagonal shape, you can be confident it will look amazing over your campfire. Deep cleaning will take quite some time, and getting this coffee maker to make perfect coffee comes with a learning curve, but these should not be deal breakers as they are typical of Moka pots. With the Kohipress French press coffee maker, you will not only get a reliable method of brewing coffee when on the go, but also an insulated mug for keeping the brew hot for long. Also, the coffee maker is designed to last long and withstand the abuse that comes with the outdoors thanks to its sturdy stainless steel body. Like any other French press coffee maker, it has a full immersion steeping method that delivers the best tasting and full flavor coffee and a completely leak-proof lid to prevent messes. And this leak-proof lid also enhances portability. Also, the reusable filter helps to make this one of the best travel coffee makers as it will eliminate the need to buy paper filters and is more environment-friendly. And this coffee maker includes a patented self-lock mechanism for separating coffee from the used grinds for easier cleanup. The coffee maker seems to have a smaller capacity than what heavier coffee drinkers would have liked, but it should still be able to make at least one and a half cups of coffee at a go. The sleek look of this travel coffee press is the first element that will draw many coffee lovers to it, but there is way more to it besides the looks. It is a versatile appliance that has been designed to make both tea and coffee on the go, and it uses a double micro-filter that will give you rich coffee with no grits or grinds. And you do not have to drink all the coffee at a go since this coffee press also has double-walled stainless steel insulation to keep it hot for at least 4 hours. Another element about the coffee maker that many users will love is that the extraction stops immediately you start pressing to ensure there is no over-steeping. As this coffee maker ages, the plunger can become harder to push or pull out, but this is a common issue with many French presses that you can easily solve with proper and regular cleanup. Bodum makes this travel coffee maker with the average coffee drinker in mind, and one of their main intentions is to ensure quick and easy coffee making. Besides being one of the smallest travel coffee makers on our list, this Bodum French press is also more versatile as it will make both tea and coffee. The coffee maker is also made for durability as it will feature a double-walled stainless steel construction that also provides insulation to keep coffee hot for many hours. Also, this top-notch coffee maker has a leak-free lid, a built-in plunger with a reusable filter and a non-slip grip for easy carrying. One minor issue with this French press is that like many others, the plunger will not go all the way to the bottom which wastes some of the coffee. But the good news is that the quantity of coffee that is not plunged is almost insignificant. 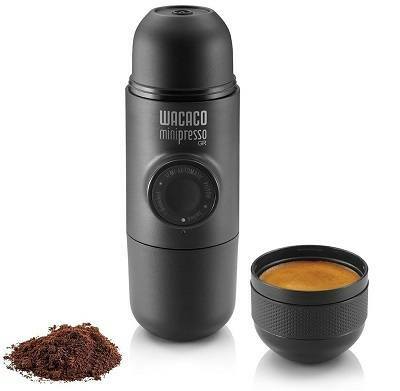 While it is true you will hardly get a travel coffee maker that will give you an espresso-quality brew, Wacaco’s Minipresso GR will come closest to delivering a true espresso shot. It is a lightweight and compact coffee maker that is incredibly travel-friendly and comes in a highly innovative and easy to use design even for beginners. The hand-operated coffee maker does not require any electricity or compressed air for operation, and you can also choose from different water tank capacities when buying. Coffee lovers will also like the fact that it is compatible with all coffee grounds varieties. And overall it is an aesthetically appealing and sleek-looking coffee maker with a sturdy and durable overall construction. When compared to others on our list, this is a more expensive coffee maker but given the quality of coffee you get and brewing speed, it is worth paying a few extra dollars to get it. Being the smallest travel coffee maker on our list, this Wolecok product will be perfect for those that prefer to travel lightly or do not have a lot of space to dedicate to a coffee maker. It is a collapsible silicone coffee maker that will take up almost insignificant space of your travel pack, and the material used to make it is food-grade and FDA-approved. Also, this silicone pour-over coffee maker is dishwasher-safe for easy cleaning and is heat resistant to ensure you can make your coffee as hot as you like it. The coffee maker will not stick and is designed to be non-hazardous and non-toxic to ensure you always drink great tasting coffee. Given that it is dishwasher-safe, the coffee maker is also easy to wash, and this is also the second most affordable option on our list. Some coffee lovers might be put off by the fact that they will still need to buy paper filters when using this coffee maker, but they are cheap and widely affordable, and you will hardly find a pour-over coffee maker that does not use them. 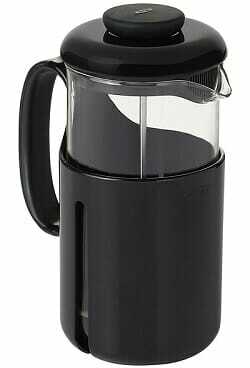 Zyliss makes this versatile French press coffee maker for the coffee lovers that want to enjoy a good brew on the go. They make the coffee maker with a fine mesh filter that will ensure you only end up with the rich and bold coffee in your cup and not annoying grits or grinds. 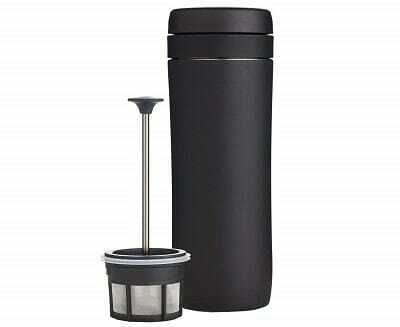 This coffee maker is made from BPA-free materials for safety and with double walls to keep your coffee hot for long. Also, it will make some nice tea and other beverages like chocolate besides coffee which makes it a versatile appliance that will allow you to enjoy your favorite beverages on the go. And it is also dishwasher-safe for easy cleanup. The shape and size of the mug might not fit cup holders in many cars, but this should not be a deal breaker given that it has not been built specifically for placing on the cup holders, and this does not also affect its coffee making capability. There are different coffee makers that will be perfect for use on your travels from the French press to the pour-over and AeroPress. 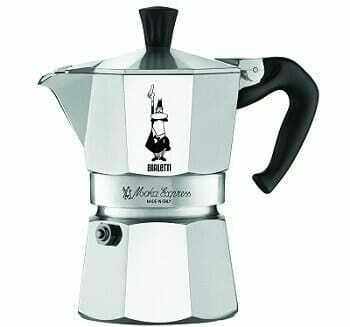 These coffee makers are also available in several brands and model options. But, to make sure that your search for a good travel coffee maker is less hectic and does not take up a lot of your time, you should watch out for the following things when shopping. #1. How Much Coffee Do You Drink? Travel coffee makers will come in different styles and sizes which mean that they can make different amounts of coffee. Hence, one of the first things to consider when choosing one is the amount of coffee you drink. 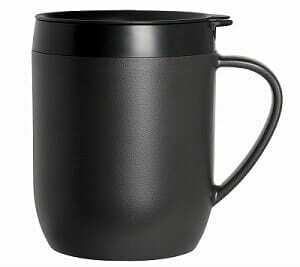 Capacity is often more important for the heavy coffee drinkers given that most of these travel coffee makers can make at least one or two cups of coffee at a go. French press coffee makers are in most instances the best for those that take a lot of coffee since you can easily get a model with a high capacity carafe that is still travel-friendly. 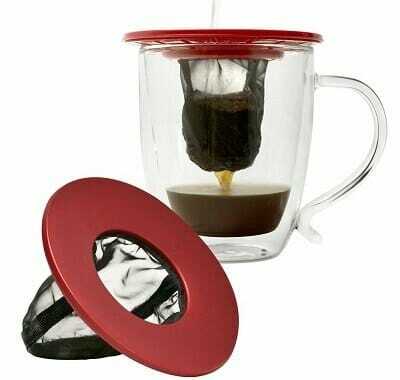 Also, given the coffee making style of the pour-over, it will also be ideal for heavy drinkers. #2. Where Will You Be Drinking the Coffee? Where you will be drinking your coffee from and hence where you will have to use the coffee maker also matters a lot when picking something for use on your travels. Do you want something to make coffee from your hotel room or for use when camping out in the woods? For hotel rooms, almost any coffee maker can work for you given that there is access to power, but the noisy models might be an issue. However, for camping, the electric models are not an option given that you will not have access to power. Also, for the coffee lovers that want something to use when on the road, it will be vital to make sure the coffee maker has a spill-proof design to prevent messes and special insulation to keep coffee hot. 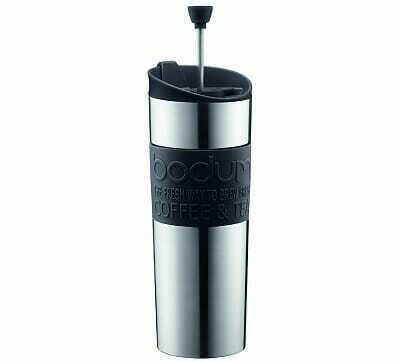 You do not want to wait for ages to get your coffee on the go. Hence, the best portable coffee maker for you is one that makes coffee in the shortest time. The brew time will vary from one type of coffee maker to the other, and the right option for you will depend on where you will be making the coffee from and how much time you will have to spare. Typically, the best coffee makers for use on the go are those that will offer a brew times of between 30 seconds and 5 minutes. You will probably not get the same quality of coffee you would get from your home espresso machines with these small and compact coffeemakers that are in most instances manual. However, the best type or model for you is one that offers decent coffee quality or at least something that can give you that caffeine kick you want. 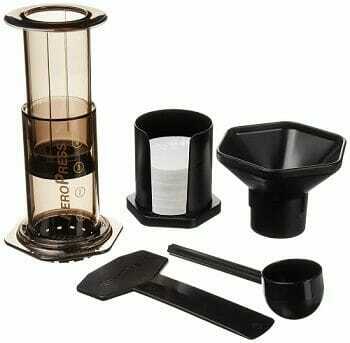 A good portable coffee maker should be able to make strong enough and flavorful coffee. For most people, the French press provides one of the best coffee qualities that one can expect to get on the go. But, also note that with any travel coffee maker, the quality of coffee that you get will depend on your brewing know-how and experience. Before buying a coffee maker for use when traveling, it is important to determine what is required to make coffee to avoid disappointments. You will need to consider whether the coffee maker requires power to operate such as the electric models or the process is entirely manual like the French press and pour-over coffee makers. Coffee makers that use electricity and batteries might give you an easier time given that the machine does most of the work for you, but they will not be ideal for certain circumstances such as when out in the wilderness. Stovetop coffee makers like the Moka pot and others that do not use electricity like Aeropress will be more appropriate for outdoor environments where there is no power supply. Cleanup is part of owning any coffee maker, and the travel models are no exception. If you do not clean your coffee maker thoroughly, it will not produce great tasting beverages. But, given that you will not always have a lot of time to dedicate to cleaning your coffee maker when traveling, or even access to essential cleaning components like a sink and lots of water, what you choose should be super easy to clean. Something that can be rinsed quickly and is easy to take apart for cleanup after use will be the best for traveling. With a travel coffee maker, you can get your caffeine fix easily and cheaply regardless of where you might be, and so having one is a great idea for a true coffee lover. Despite there being several types and models on the market, finding the best travel coffee maker only requires you to consider things like the amount of coffee you drink, brew time, quality of brew and the ease of cleaning the coffee maker. Shopping for one will also not be a tedious and lengthy process as you can be certain there is at least one model on our top 12 travel coffee maker reviews above that will work well for you.